Visiting or moving to Berlin can be compared to meeting a new person. It begins with the first impression, continues with a little small talk and then peaks at the point where the conversation gets deeper and the opinions and thoughts of the person in front of you start to mirror his or her character. Like every other city, Berlin also has a character and it will take you time and effort to get to know its real character. First of all, outer appearances: the weather, architecture, language and people on the streets will draw the lines of your first impression. Subsequently, you will reach ‘second base’ in a bar or at a club for instance, when you start interacting with its residents since they primarily shape the character of a city. Nevertheless, cultural events and experiences also play a significant role and lead to a better understanding of its culture and mentality. Now, the question is, where does the ‘third base’ start? What is at the core of Berlin? What do people care and talk about in this city? What atmosphere is hidden there? Certainly, there is one place, which is behind closed doors, where talk peaks and where its heart really beats: in the flats of Berlin; in the WGs (flatshares). People gather in the kitchen or living room of their flats every day, either to eat or drink and talk. Most diverse people from different parts of Germany or the world come together in these flats and there is at least one thing they all have in common: they are all vital parts of Berlin. Therefore, I have decided to take my relationship with Berlin to that third base. I will try to get to know the different facets of Berlin’s core character by visiting various WGs and being part of their gatherings and exchange of thoughts and opinions. Thereby I hope to be able to characterize this city from its inner perspective. I decided that the first WG of this series had to be my own, as I am aware of its one peculiarity that is very typical of Berlin. In German, there is one expedient word for it: multikulti. Our five-people WG is Chilean, American, Palestinian, British, French, Turkish, Swedish and (I almost forgot) German. Consequently, the first language of our flat is English. Cheers to globalization! 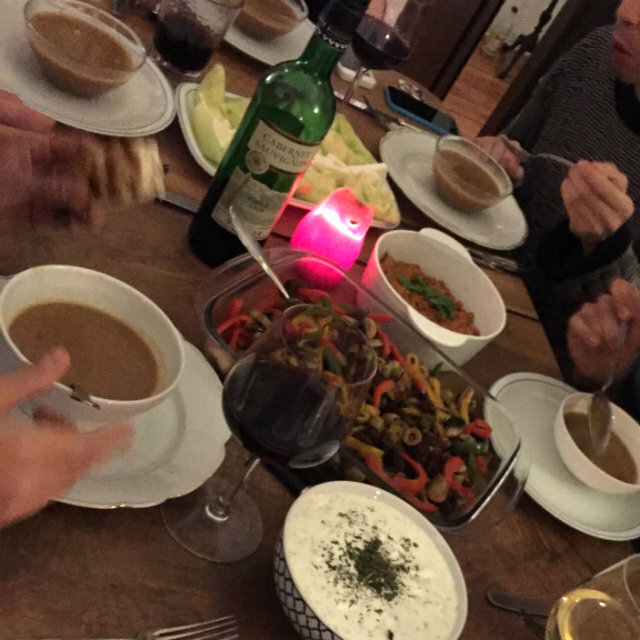 As it was a cloudy, dark and rainy evening in autumn in Berlin, we all decided to cheer us up with food, lots of food. A big cooking session started in our little kitchen around 7pm and ended almost three hours later. While cooking in a group you realize how hierarchies emerge, the ones who are talented in (the art of) cooking become the leaders and dictate the others to do the cutting. Then there are the ones, whose talent is not even enough for cutting. Admittedly parsley is extremely difficult to cut – yes, I ended up washing the dishes. However, you become some sort of team and the best of it is: you can’t only see but also taste the result of your effort. When we finally sat down the food was presented. The first course was an autumn chestnut soup with a little bit of port wine as the WG’s best cook described it. Sophisticated. We applauded and within five minutes all the bowls were emptied. In the following, our representative from Turkey presented the Turkish starters she had cooked: her meze. Apparently it is rather unusual that street musicians are that supported in Chile. Afterwards, the main dish was served: traditional German Frikadellen (basically big meat balls) with mashed potatoes, purple cabbage and sauce. At one point we realized that we unquestionably had lost our self-control and eaten too much. We had cooked food that could feed the whole WG for four days. “What are we going to do with all this food?” someone asked. “The rise of the fat” I added, “instead of showing a sun on the horizon, you’d see a fat belly.” Laughter. “Fatman rising! Have you watched that? Great movie!” We could not stop. You do not need to be a psychologist to diagnose slightly masochistic behavior of everyone at the table, since, despite everything, we decided to continue with dessert. It was another Turkish dish with white chocolate, milk and lavender and some other secret sweet ingredients that caused small fireworks in my mouth. However, the conversation developed towards different accents. For instance, snobby accents were imitated in various languages and one thing became clear: you don’t have to understand the language in this matter, as pretentiousness is an international sound. For a moment I stopped listening to the conversations and instead, I started observing everyone around me. They all seemed very peaceful and happy. Even if I have lived in Berlin and in this flat for a long time now, sometimes I am still fascinated by how well everyone gets along. It is amazing how we all have learned so much about different nationalities, manners, cultures and mentalities, simply because we live together. At the end of the day, it does not really matter which nations you belong to, as everyone is able to laugh at, cry for or feel (or in our case taste) the exact same things. 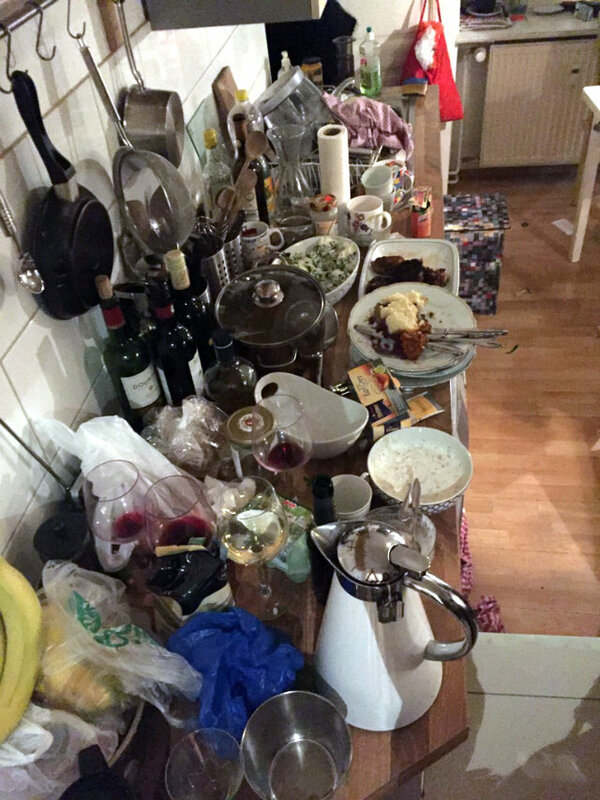 When it comes down to it, we are all just ordinary people who not only have the great talent of making our kitchen look like a battlefield but who also ignore that fact and finally decide to just fall into their beds after a food marathon.